On Tuesday, the House Committee on Science, Space and Technology held a hearing to discuss the social cost of carbon (SCC), which is probably “the most important number you’ve never heard of.” The SCC is the monetary value that represents the damage done to society and the environment by burning fossil fuels; it includes things like property damage from storms and floods, human displacement and mortality rates. The SCC was established by an interagency working group under the Obama administration and puts the price of one metric ton of carbon dioxide at about $40. The figure is critical in the cost-benefit analysis that agencies use when formulating new environmental regulations, and has been used to underpin almost 80 environmental regulations, including the Clean Power Plan, energy efficiency standards, and fuel economy rules. The title of the hearing—At What Cost? 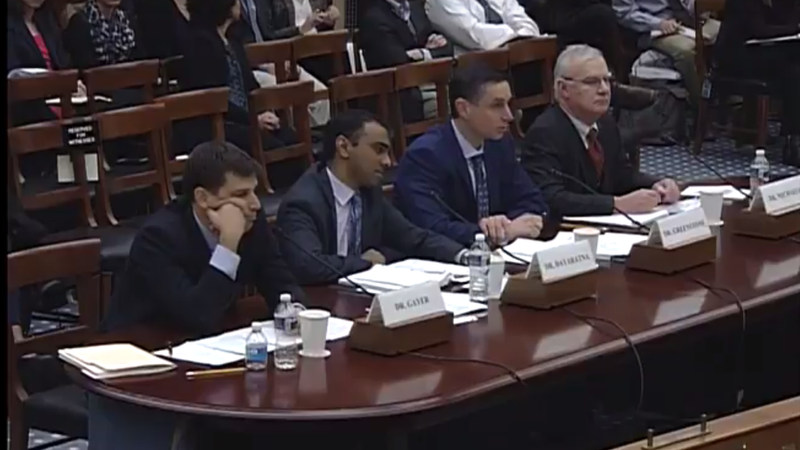 Examining the Social Cost of Carbon—was telling as to the subcommittee’s opinion on the SCC: unfavorable. Of the four expert witnesses that testified at the hearing, three had ties to conservative and fossil fuel-friendly organizations. The climate advocate in the group was University of Chicago economist Dr. Michael Greenstone, who helped establish the SCC under Obama. In an op-ed in The New York Times last December, Greenstone defended the SCC as “the linchpin of national climate policy.” The other witnesses at the hearing were Dr. Ted Gayer, a Brookings Institute economist, Dr. Patrick Michaels, of the Cato Institute, and Dr. Kevin Dayaratna of the Heritage Foundation. The SCC is nothing but a one sided manipulation of parameters to fit the policy driven agendas of the previous administration. These alarmists’ tactics need to stop. Today’s hearing is intended to uncover the real truth and deception behind the SCC. It appears that the social cost of carbon is nothing but a political tool lacking scientific integrity and transparency, conceived and utilized by an administration pushing a green agenda to the detriment of the American taxpayers. Perhaps a better measurement of the social cost of carbon is not the net damages that result from a one metric ton increase in carbon dioxide emissions in a given year, but the damage inflicted on domestic industries, including manufacturers in my district like caterpillar, by the environmental regulations justified by this flawed calculation. While economic concerns are real, and should be taken into account when considering any regulation, proposing a negative SCC would incentive the burning of more fossil fuels; a scary notion given the urgent need to reduce fossil fuel emissions. During the hearing, two of the witnesses tried to convince the subcommittee that global warming could be good for the planet. Dr. Michaels and Dr. Dayaratna both suggested that increased carbon dioxide might actually be beneficial to the environment because of increased photosynthesis. In his opening statement, Dr. Dayaratna explained that he thought this was an important “unexplored issue:"
Are there any benefits to carbon dioxide emissions? The answer is surprisingly: yes… In fact, under some assumptions there are substantial probabilities of a negative SCC: meaning increased CO2 fertilization, leading to increased agriculture and forestry yields. This isn’t the first time that this argument has been used to try to convince Congress that they shouldn’t take global warming so seriously. In 1992, members of Congress were shown a film produced by the fossil fuel industry that purported to show that increased carbon dioxide levels will be beneficial for the planet. The film, called The Greening of Planet Earth, was highly successful in convincing members of Congress that there was still no solid consensus among the scientific community regarding climate change. The meat of the hearing focused on the nitty-gritty calculations of the SCC. One of the issues that was repeatedly touched upon was the calculation of the SCC’s discount rate, which is critical in establishing the SCC. The discount rate is the figure used to calculate the present value of future costs or future benefits. Economists have long disagreed about the proper discount rate for climate change; the central problem is that calculating a discount rate requires making a number of arbitrary assumptions, like how much you value the welfare of the current generation compared to the welfare of future generations. It’s unclear what will happen to the SCC under the Trump administration, but it’s unlikely to be anything good. Thomas Pyle, the head of the Trump transition's energy team, wrote in a leaked memorandum that he planned to end “the use of the social cost of carbon in federal rule makings.” Given Trump’s stance on climate change, this isn’t too surprising, but it is nonetheless disheartening. Doing away with the SCC would be like throwing the world’s biggest party, which used up all of the available resources, and then leaving future generations to foot the bill.